The shoulder joint has the largest range of motion of any of your joints, which makes it the most vulnerable to injury. The joint has the ability to move into 1,600 positions throughout a three-dimensional space. This freedom of movement makes the shoulder vulnerable because of an inherent lack of stability that allows for movement. The dumbbell bench press is an example of an exercise that may compromise the shoulder due to stress on the joint. 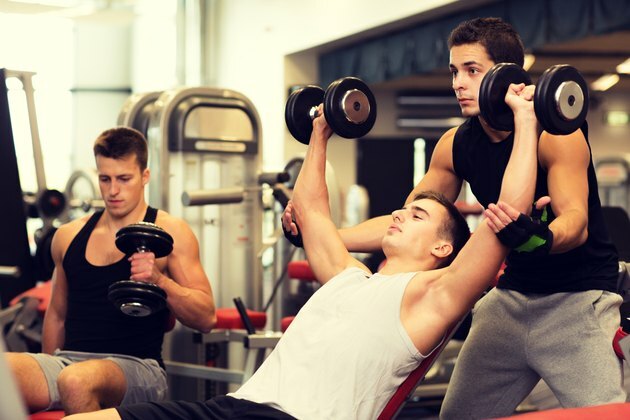 Weight lifters who overtrain their chest, shoulder and middle back muscles often suffer from primary shoulder impingement; it is also common in athletes in their 30s, according to Sports Injury Bulletin's website. Impingement is when the rotator cuff muscles are squeezed between the upper arm bone and a bony area of the shoulder called the coracoacromial arch. Weak rotator cuffs increase your chances of developing impingement. The dumbbell bench press is a traditional weight training exercise for the chest and shoulders. It places stress on the shoulder joint, though less than some exercises and more than others. A dumbbell bench press targets the anterior and medial deltoids, pecs and triceps. The anterior and medial delts are the front and side portions of the major shoulder muscles. The pecs are the major muscles of the chest. This exercise also works the rotator cuffs as secondary muscles. If you have strong rotator muscles to stabilize and assist during this exercise, you are unlikely to experience pain or injury. To perform the exercise, lie faceup on a bench, holding dumbbells next to your armpits with the elbows bent. Press the arms straight up and not out to the sides. A barbell bench press may place significant stress on your shoulders. Holding a barbell using a wide grip stresses the ligaments on the front of the glenohumeral -- or ball and socket -- joint because of the horizontal abduction movement. Horizontal abduction is when you move your upper arms sideways away from the middle of your body. A wide grip means that your hands are far apart. The farther apart you hold them, the more horizontal abduction your shoulders perform during a bench press. Using spacing narrower than 1.5 times your shoulder width avoids stress. Because a dumbbell press limits the width of the arms, it places less stress on the shoulders than the barbell bench press. Closed-chain exercises such as pushups are safer for your shoulders than open-chain exercises, such as bench presses. A closed-chain exercise involves a fixed position at the end of the limbs you are moving. For example, during a pushup your hands are in a fixed position on the floor. Your hands move during the dumbbell bench press, so it is an open-chain exercise. Since the hands are far away from the shoulders, the bench press creates more stress to stabilize the arms and shoulder joints. Lifting weights higher than shoulder level significantly stresses your shoulder joint. These types of exercises include overhead presses and incline presses. A bench press is less stressful than these exercises because your arms remain at a 90-degree angle to your torso with the weight over your chest, which is easier to stabilize.